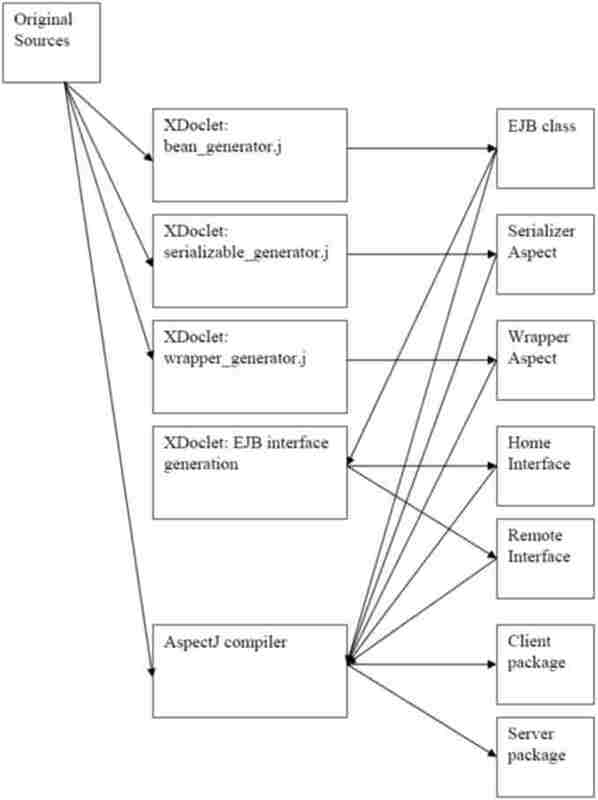 AspectJ compiler compiles all generated code (including regular EJB code and AspectJ aspect code from step 1 to introduce distribution to the client by redirecting all client calls to the EJB instead of the original object. Using the GOTECH framework requires to configure it for the intended application. The settings for ant are stored in the GOTECH.properties file and will be explained below. All configuration settings must have valid values in order for GOTECH to work correctly. The following directories are used and created during the transformation process. In this section we present an example of applying the GOTECH framework to convert a scientific application into a distributed application interacting with an application server. The original application is a thermal plate simulator. Its back-end engine performs the CPU-intensive computations and its front-end GUI visualizes the results. The distribution scenario we want to accomplish is to separate the back-end simulation functionality from the rest of the application. and to place it on a powerful remote server machine. There are several benefits gained by this distribution scheme. First, it takes advantage of the superior computing power of a remote server machine. Second, multiple clients can share the same simulation server. Finally, if real heat sensors are used, the user does not have to be in the same physical location with the sensors to run the experiment. The distribution scenario for the thermal plate simulator is one where the GUI is running remotely from the core application and used a facade class to communicate with it. A simplified UML diagram for the original version of the thermal plate simulator is shown below. We have laid out the class diagram so that the front-end and back-end are clearly visible. The hierarchy under interface Plate contains the types of the objects that form the connecting link between the application�s front-end and back-end. The graphical front-end creates a Plate object and several visual component objects reference it and query it to obtain the necessary data when performing their drawing operations. The Plate object gets modified by being sent as a parameter to the diffuse method in the Simulation class. Once the diffuse method returns having modified its Plate parameter, the front-end is signaled to repaint itself. The visual components can access the updated data of the Plate object and redraw. Notice that making simulation classes remote while preserving the original execution semantics requires special handling for remote method parameters. The Plate object that participates in a complicated aliasing (i.e. multiple referencing) scenario now becomes a parameter of a remote call to an EJB. If a copy-restore mechanism is not provided by the application server, then the process of bridging the differences between local (by-reference) and remote (by-copy) parameter passing semantics becomes a tedious and complicated task. The use of NRMI (copy-restore semantics) completely eliminates the need for special purpose code to reproduce the back-end changes to the Plate object inside the front-end. Distributing the application using GOTECH is done in six steps. � The classes affected by the xdoclet task are the same as in the first step. � The generated aspect simply tries to make all parameter types implement Serializable, whether source is available or not. This step relies entirely on the functionality provided by XDoclet. It has its own section in the build file. For documentation please refer to www.xdoclet.org. In this step, the remote and home interfaces of the previously generated bean class are created as well as the necessary deployment descriptors for JBoss. In this step, the AspectJ-compiler is called to compile all sources. Two compiler runs are necessary, one for the client classes and one for the server classes. The classes are created in the specified output directories and the aspects created in the previous steps get interwoven into the original code. In the packaging step, jar-files are generated for the client and the server. The server-jar is then deployed at the application server. The functionality provided by ant is sufficient for copying and jarring the files. Click here to see the GOTECH tutorial. For questions, comments, and bug reports please contact Stephan Urbanski or Eli Tilevich.